First and foremost, NAWBO is a one-of-a-kind sisterhood comprised of women business owners who come together as peers to share their experiences and best practices with each other. Within our NAWBO family, there is a strong sense of wanting to help other women entrepreneurs overcome challenges and realize their dreams. One of the greatest member benefits we offer is a support system of amazing, talented women with shared interests and aspirations who are experiencing similar challenges and opportunities, or have the hindsight of having faced these before. They are here for, and genuinely interested in, helping you succeed by offering sound ideas and advice. We can’t emphasize enough how important it is for women entrepreneurs—at any stage of business growth, whether you’re a start-up working from a home office or running a multimillion-dollar company – to belong to an organization like NAWBO. As a national organization, NAWBO is committed to and actively engaged in driving an agenda in Washington, DC and state capitals that advances opportunities for women entrepreneurs and business owners. In Washington, DC, the special interests of business sectors from A-Z, not to mention others like organized labor, are represented by a horde of associations and entities that speak to what are often their narrowly defined sectoral interests. But who speaks for women entrepreneurs? Who stands up for the interests of women business owners in the halls of Congress and with the regulatory agencies? Your dependable and determined advocate is NAWBO. Our organization is dedicated to working on behalf of women business owners. Women business owners cannot sit on the sidelines and hope things go their way. We must actively be working to create a more dynamic business climate that supports women in business whether you are a budding entrepreneur or running an established company. Throughout the year, NAWBO hosts numerous events, like the annual Women’s Business Conference, to bring members together to share best practices, hear from experts and socialize. All programs are open to guests, however it is important to register online, click here: www.NAWBODelaware.org (Events). During any program if you decide to join, the Delaware Chapter will apply your program fee (with exception of special event fees) toward your annual membership. Where: Our Inner wisdom connects us to the world of possibility, action and support. organization… expand your reach, BUILD your business! Thursday, January 15 I 6:00 – 8:00p.m. Does the process of putting a plan down on paper overwhelm you? Then “ KIS “ it—Keep it Simple. This Program will do just that! THE DEBUT OF THE FIRESIDE CHAT SERIES FOR MEMBERS ONLY! entrepreneur in a quaint intimate setting. Members please check back online to find all the details for this NEW exciting quarterly event. Our intention is to build a strong sisterhood where we do not have to go it alone. To nurture one another and form long lasting relationships that inspire creativity, meet challenges and bring out the best in us. A panel of experts will share tips and tricks & field questions to help you build your power brand! National Association of Women Business Owners provides a strong voice and vision for women business owners in all industries. Members benefit from NAWBO’s advocacy on business issues at the local, state and national level. Membership includes sole proprietors, partners, and corporate employees with day-to-day responsibilities of building business relationships. Every member can relate directly to your experience as a business owner. Members forge connections with other women business owners to exchange ideas and leads. Members help other members to achieve greater visibility, credibility and profitability for their business. Members may access NAWBO’s powerful web-enabled database of women business contacts and resources nationwide. Members may attend conferences and seminars on a wide variety of business development topics as well as trends, regulations and new technologies that impact their business. Members may take advantage of leadership training opportunities. Members are encouraged to join committees, participate on boards, and showcase their expertise through the speakers bureau. Members gain access to certifications as women-owned business, which can lead to increased procurement opportunities with governments and corporate purchasing programs. Members gain access to research conducted by the Center for Women’s Business Research. Members achievements are recognized through national awards and website articles. NAWBO also provides opportunities for members to publicize their business success stories and to advertise and promote their businesses through media and speaking opportunities. Members are offered discounts by NAWBO Corporate Partners and affinity programs. Members also may take advantage of discounted rates to attend NAWBO-sponsored events. Register online with NAWBO national headquarters. It’s quick, easy, and you can pay online! Register in person at our next event. See our events calendar for information about our upcoming events. One of our representatives will be happy to help you register for membership at the event. Susan Hager was an original member of the group of 12 women business owners who got together informally in 1974 and founded what became NAWBO. She was not just one of the original founding mothers of the National Association of Women Business Owners and our first national president, but a stalwart champion of women’s economic empowerment and a steady voice for leading us to think beyond what was– to what could be possible. 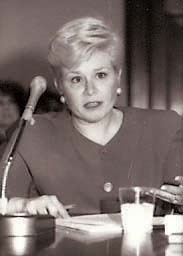 Susan was an intricate part of getting the HR 5050 Women’s Business Ownership Act passed when she testified on Capitol Hill (shown in photo above). That important law signed by President Reagan changed the landscape for all women business owners everywhere in this country (just 27 years ago).